Experience the rural rice terrace and karst landscapes of the Guangxi Region on this 4-day active China trip. 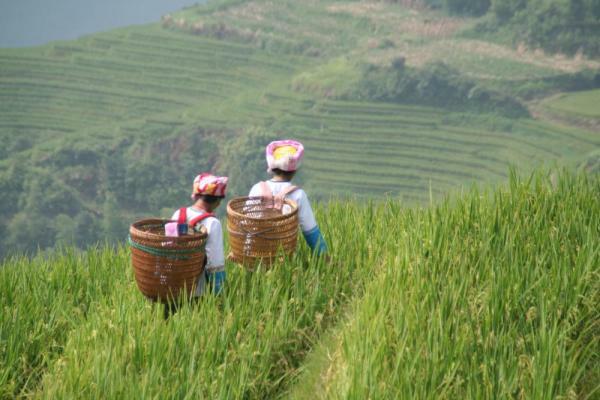 Visit the Longsheng Rice Terraces and connect with the Zhuang and Yao people and glimpse into their quiet way of life. 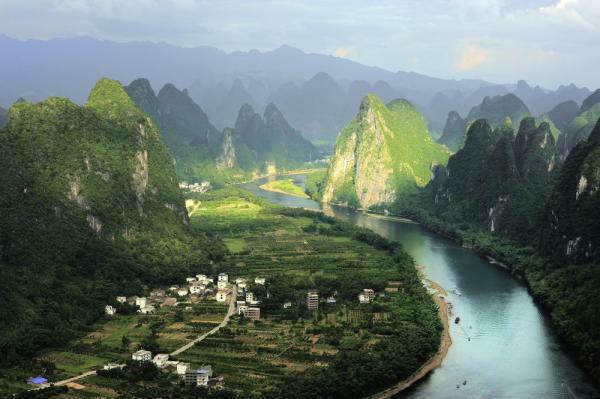 Hike, bike and raft as you explore the breathtaking karst landscapes that follow the Li and Yulong Rivers. 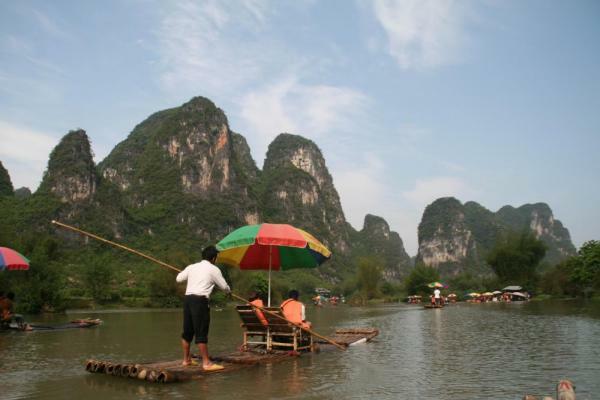 Enjoy four days in breathtaking scenery on this Yangshuo adventure. Arrive into the airport in Guilin where you are met by your guide and start the 1.5-2 hours drive to the Longsheng scenic area. Here you may store your larger luggage before you switch vehicles and board the Ping'an shuttle that takes you an additional 40 minutes on to Ping'an Village. The village has been traditionally inhabited by the Zhuang ethnic group and is surrounded by rice terraces. From here, hike a half hour uphill to Li'an Lodge and settle in for the evening. The minority group of Zhuang people here are the second largest of 56 recognized ethnic groups in China. The majority follow an animist faith which includes elements of ancestor worship. The Yao people, another minority group in the region, wear heavy earrings, have long hair, and work the rice paddies. Their rice terraces, built over 650 years ago, cover an area of over 16,000 acres and span an altitude between 980 ft and 3600 ft. Every year in May or early June they flood the rice paddies and transfer young plants into them to re-plant for the harvest in fall. Their wooden houses dot the terraces with their colorful tiles. 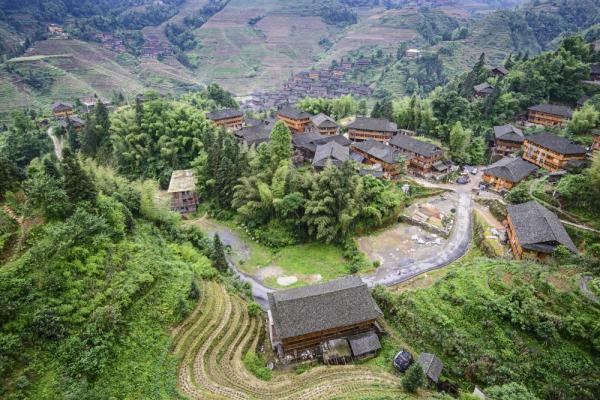 After checking in to your lodge, explore the charming Zhuang village. 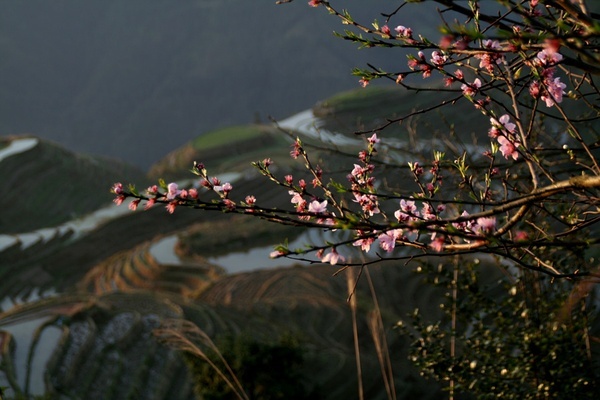 You may even have time to do the round trip 2 hour hike to nearby Longji Village. After breakfast, hike back down to the Ping'An parking lot for the shuttle bus back to the Longsheng Scenic Area. Drive about 2 hours to Yangdi Village to start today's hike. Follow a gentle trail along a more isolated stretch of the picturesque Li River. Take bamboo rafts or local ferries a few times to cross the river, passing through local villages along the way. See village kids playing, water buffalos, rice paddies and tangerine yards. After 4-5 hours of hiking, arrive to the trail's end in Xingping Village. Explore this old town with history dating back over 800 years. 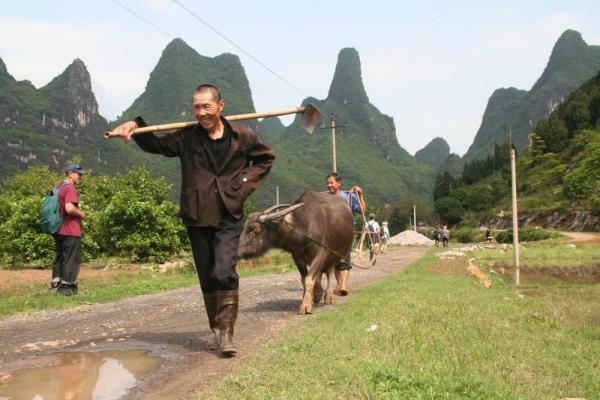 From Xingping Village you will drive an hour to a new hotel near Moon Hill in Yangshuo. Enjoy some free time the evening to explore Western Street, Yangshuo's oldest street with 1400 years of history from a variety of cultures. Hiking: 7-9 miles / 12-15 km / 4-6 hours. Flat hiking. Yangshuo is a lovely town set at the base of the Li River, which meanders through steep limestone peaks. This landscape paints one of the most dramatic backdrops in all of China. 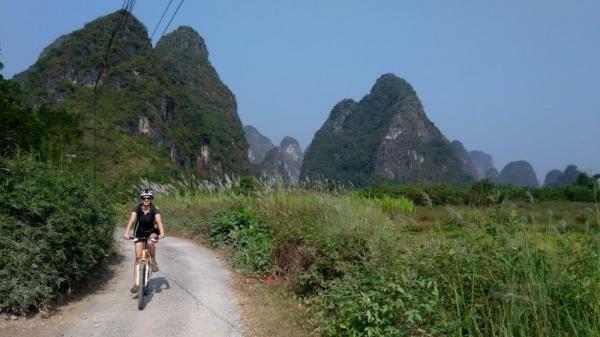 Today we bike from our hotel on roads through villages, narrow trails along rice fields, and along the Yulong River. Though not as large, the scenic Yulong River offers a more remote and peaceful experience away from the tourist boats found on the Li River. After your bike ride, stop for lunch at a local farmer's house, and then embark on a 2 hour bamboo raft for a smooth ride downstream to the pier. Cross over dikes and continue to raft downstream. 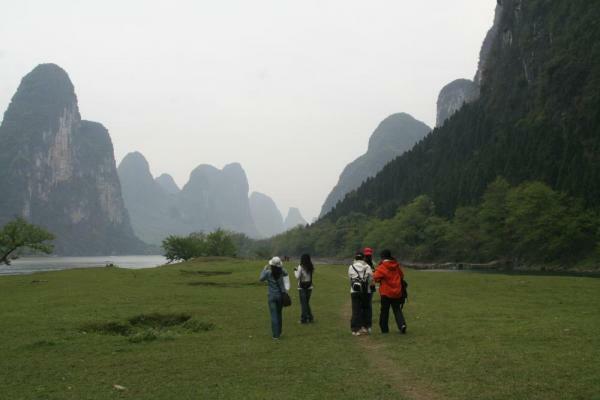 Before returning to your hotel, hike a half an hour up the famed Moon Hill and enjoy the stunning karst landscape view. This evening is free for you to explore. We recommend opting to attend the Impression of Liusanjie Show, a night time laser lights show over the water. The show was created by Mr. Zhang Yimou, the director of the Olympic opening and closing ceremonies in 2008, and is a visitor favorite. Biking: 12-18 miles / 20-30 km / moderate difficulty on flat, sometimes narrow trails. This morning drive 20 minutes to nearby Fuli town. Located along the Li River, it is one of the best preserved ancient towns in Guilin. Get a taste of true rural life away from the tourist scene in this small and quaint town. See the local market in action and watch as locals sell vegetables, crops, herbs, meat, and live chickens and ducks. The market occurs everyday, but to see it in full swing, come on a day of the month ending in a 2, 5 or 8. Fuli town is known as the hometown of Chinese painted paper fans. Wander the fan-making workshops and perhaps witness a vendor making a fan inside the shops. After lunch return to the Guilin airport for your flight on to your next destination.